As a homeowner, having a freshly paved asphalt driveway will create a great curb appeal of your home. To help you manage your asphalt driveway, we have compiled a list of frequently asked questions that you might ask before or after having your driveway installed by an asphalt paving company. There are many different benefits of using asphalt to pave your driveway. Asphalt is very durable and will last many years through high volume traffic. Asphalt driveways that are constructed properly last significantly longer than alternative pavements, typically lasting between 25 and 30 years. Asphalt also costs less to install than other alternatives and is even recyclable! Is there a time of year that is better to install an asphalt driveway? An asphalt driveway paving company can usually install a driveway all year round if the temperature and ground conditions are adequate. Paving operations can be weather dependent due to moisture. If it is heavily raining or snowing, your asphalt contractor will normally reschedule the project to a dry day. How long does it take to pave a new driveway? When having your driveway paved, scheduling will be determined by these 3 factors; conditions of the base, weather, and the homeowners schedule. Majority of the time a driveway can be finished in a day or less depending on the weather and size of the area. If a driveway is installed properly by an experienced asphalt contractor, it generally should last between 20-35 years. There are many factors that can affect a driveway's life, such as weather conditions, drainage and usage. Be sure to schedule regular preventative maintenance to keep your surface long lasting. Should I put a seal-coating on my driveway? Generally, it is recommended that driveways have a sealcoat application put on. Seal-coating is a thin layer that is added over your paved surface. The sealer protects damage caused by rain, snow, UV rays, and fluids from vehicles. There should not be any foot or vehicle traffic on your freshly paved driveway for 24-48 hours. What are the advantages of asphalt over concrete? Asphalt is more cost efficient than concrete and is less expensive to repair. 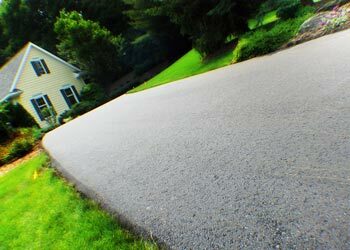 Asphalt can easily be resurfaced and usually does not need to be removed. How do I maintain my asphalt driveway? Maintenance! If your asphalt driveway does not have the proper maintenance you will end up needing repairs. Set up a maintenance routine with your asphalt paving company that starts with seal-coating your driveway every few years, this will help extend the life of your asphalt. If you ever happen to notice any cracks, potholes, etc. you should have them repaired as soon as you can. When an asphalt driveway ages, issues left unrepaired will only worsen. Having repairs done earlier is more cost efficient than having to eventually replace your entire pavement. Whether you live in Grand Rapids, Kalamazoo or anywhere in West Michigan, our driveway paving contractors got you covered! We hope you have found this information helpful in your research on asphalt driveway paving. If you have more questions about asphalt paving, or are in need of service, contact A-1 Asphalt Inc., your top driveway paving contractor today.